The plywood we chose is Brazilian pine, rated weather and boil proof. When we consulted our local world champion race boat builders, they said you must under no circumstance use cheap plywood. 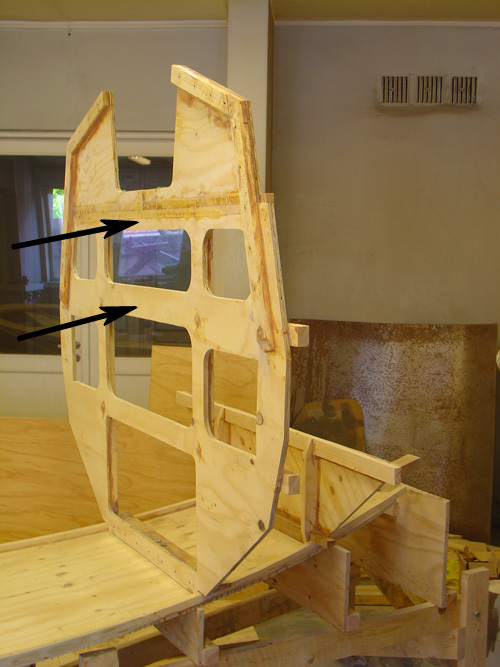 They use very thin aviation grade plywood and cover it with carbon fiber. They also said that the “red glue” is what you want between plies. Just about the only thing our plywood has in common with the aviation grade plywood is the glue, and that is a fingers crossed guess. The wood is rated C, which means that it has voids in it. The surface is rather rough, with dents and visible knotholes on surface veneers. We cut the material with special laminate rated jigsaw blades, no significant chipping. You can read about our boiling and baking tests on the page before. The arrows show the direction of the bulge, pointing aft. The bulge has developed on every wood+plywood lamination we have done so far. Moisture content is one of the possible causes of this, though the wood had been sitting for at least two months in our warm well ventilated garage. The second option being the epoxy, which also soaks the wood. Soaking the wood, filling its pores and then solidifying might also explain the bulge effect. What speaks for the second cause is the fact that this also happened when we laminated 12 mm plywood onto 9 mm plywood. Bulging occurs on virtually every combination of material. This creates stresses in the structure, which might be beneficial (think hardened glass) or abysmal. Time will show. We have yet to see how the material handles in seawater, when glassed and painted.